Pearl Wave is an interactive lighting installation for yachts. A mix of handmade opal spheres are elegantly hung from gold metal rods. 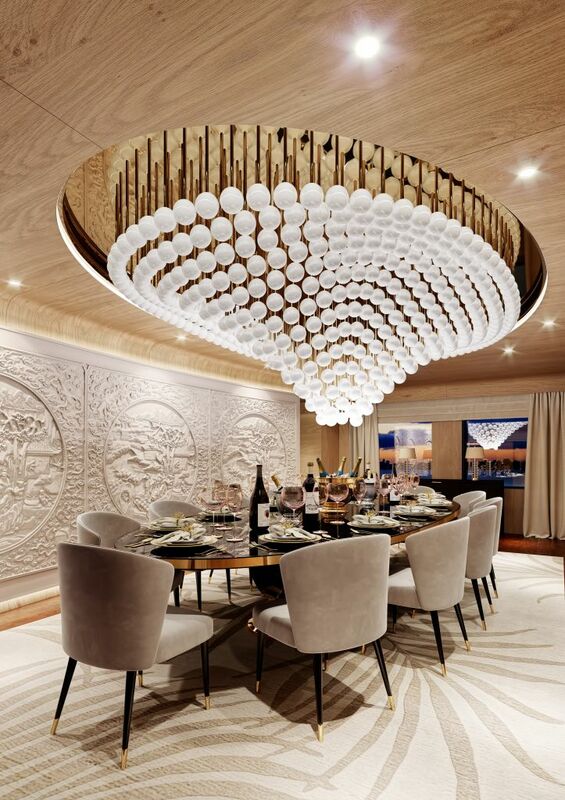 The playful chandelier reacts to the happiness surrounding it; when glasses are cheered in a toast, Pearl Wave joins in with a burst of light. The design process for Pearl Wave was quite deliberate. First and foremost, it had to be interactive. Second, it was to be installed on a yacht. Finally, it had to surprise and make people smile. We achieved this by designing the interactive element to be activated via something celebratory -- the clink of glasses raised in a toast. Because of Preciosa’s extensive maritime experience, we were able to produce sturdy rods that would withstand the ebb and flow of the sea. 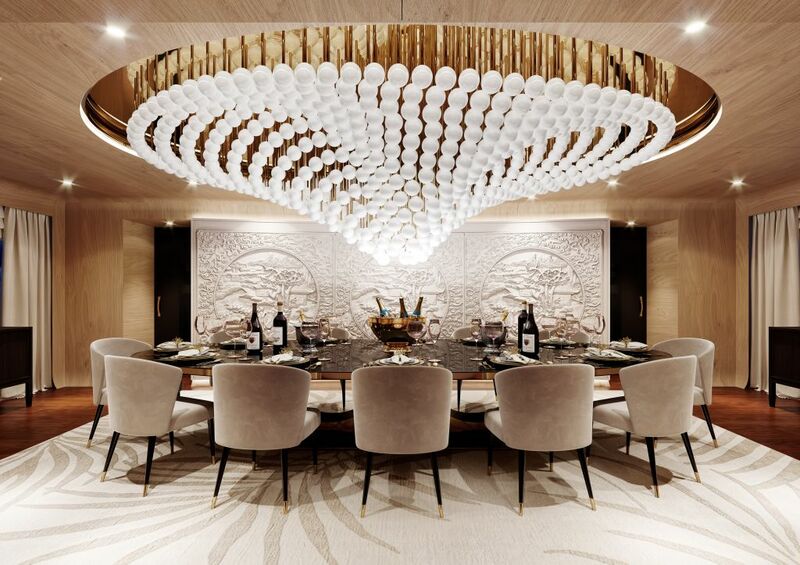 Pearl Wave is a custom designed piece by Preciosa’s Creative Directors, Michael Vasku and Andreas Klug. Pearl Wave’s flow takes inspiration from sea waves and its curving form from the shape of a seashell. 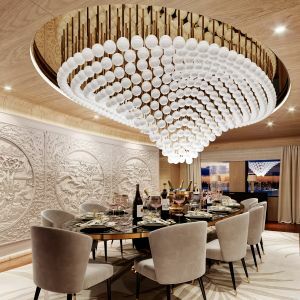 Preciosa is a leading designer and manufacturer of a wide range of breathtaking lighting objects specially designed for yachts and cruise ships. Pearl Wave’s spheres are made from a unique element called Triplex Opal. This is a rich material with great visual depth and is beautiful in both day and night conditions. One of the highlights of Pearl Wave is that the technology is programmed, not static. That means every time glasses are clinked a new reaction will occur. The sparkle seen in people’s eyes as they watch Pearl Wave come to life is our ultimate reward. 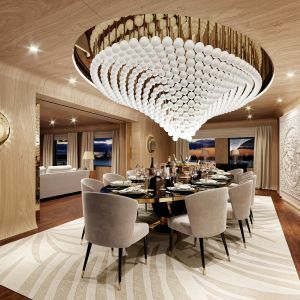 Pearl Wave debuted at the Monaco Yacht Show 2018. As guests streamed in and out, gathering around our table for a celebratory glass of champagne, Pearl Wave behaved in a sparkling and appropriate way. Where will your next light go? 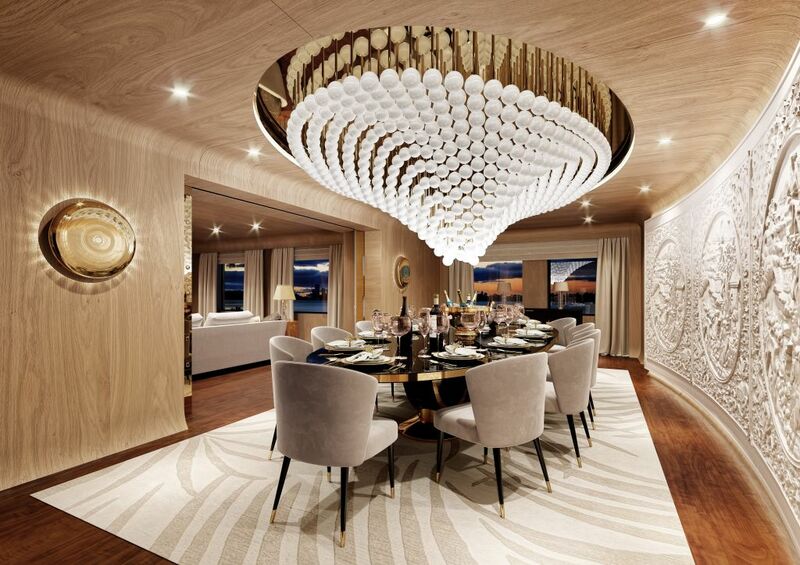 On dry land or sailing the seven seas, Preciosa’s design team works with you to create one-of-a-kind installations that enable guests to encounter outstanding lighting experiences. Our ultimate goal is to bring life and value to spaces. Get in touch so we can create some inspiring lighting together.